It’s called the Tax Cuts and Jobs Act of 2017, reflecting the promise that cutting taxes on corporations and other “job creators” will unleash a gush of capital investment and plentiful good jobs. So far, the job-related impact of cutting the corporate tax rate from 35 to 21 percent has been limited mostly to well-publicized one-time bonuses paid to scattered portions of the workforce, and wage increases that had already been announced or in the works. Still, it is early days, and we can all hope that before long substantial hiring will begin in all the new appliance factories and re-opened coal mines. Then again, severe doubts that the tax cuts will deliver as promised are not confined to Democrats and left-leaning economists. 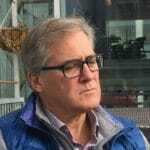 “Since most companies are not cash constrained and credit markets are liquid,” according to a JP Morgan analysis, the “impact on capital spending is likely to be modest.” Corporations are not expected to spend their tax-cut windfall on new plants and equipment or research and development in a frenzy of investment that will invigorate the economy. Instead, companies will pay down debt, buy back their own shares, and pay out larger dividends to the wealthiest 10 percent of people who own 80 percent of U.S. stock. Make no mistake, there will be a lot of jobs created in the U.S. in coming years. But the occupations that will see the most openings over the next decade, like the jobs that are most commonly held today, have little if any connection to tax-cut inspired economic vitality. The services – and they are overwhelmingly services – provided by those jobs are not only important to the economy but, in some instances, indispensable to society. Society doesn’t seem to think so. The occupations most commonly held by Americans today, as well as the jobs that are expected to grow most tomorrow, tend to pay poorly, offer few if any benefits, are rife with instability and leave tens of millions of working people in poverty. The new tax bill isn’t going to change that. Every two years the U.S. Bureau of Labor Statistics (BLS) prepares a 10-year employment outlook. The most recent report, released in October, two months before the tax cut bill was signed into law, projects that the U.S. will have 11.5 million more jobs in 2026 than it had in 2016. The single occupation projected to grow the most is personal care aides, the overwhelming majority of whom provide in-home assistance to the elderly. A closely related occupation, home health aides, ranks 4th on the list. The two jobs combined are projected to account for more than 10 percent of all new U.S. job growth by 2026. The median annual pay for home care aides, according to BLS data, is about $22,000. However, the Paraprofessional Healthcare Institute, which advocates for home care workers, estimates that when low pay is combined with erratic scheduling and other factors, home care aides typically earn less than $14,000 a year. 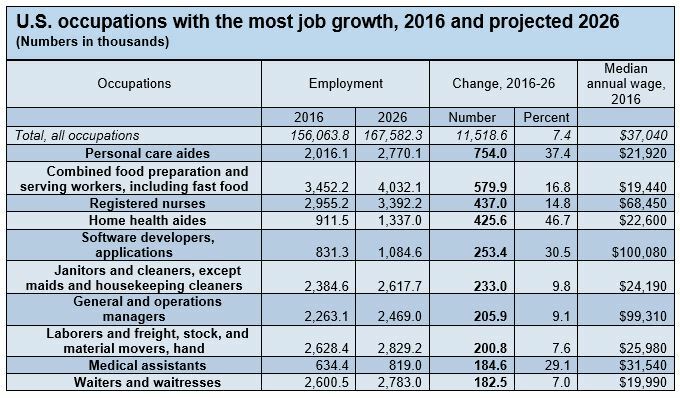 In addition to the growing prominence of home care aides, the biggest difference between BLS 10-year employment projections issued in October and the projections the bureau issued two years earlier may be the disappearance of retail salespersons from the list of jobs projected to grow most. Trendy prognostications about the decline and fall of retail employment notwithstanding, BLS does project that retail employment will continue to grow – just not at the same rate as it has over the past several years. In fact, by 2026, the single occupation employing more people than any other in the U.S. is projected to be the same occupation that held that distinction in 2016: retail salesperson. 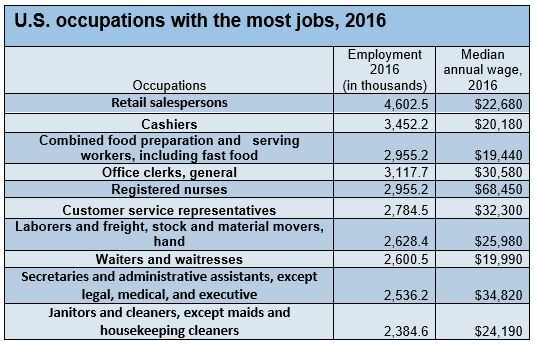 Also by 2026, the occupations immediately following retail sales, in terms of total employees, are projected to be the same that immediately follow retail today: cashiers and “combined food preparation and serving workers, including fast food.” The median annual pay for retail sales in 2016, as reported in BLS data, was $22,600. For cashier and food service occupations, it was about $20,000. A review of the bureau’s total projections for all occupations finds more than one-third of the 11.5 million jobs projected to be created between 2016 and 2026 are in occupations with median annual wages of less than $25,000 in 2016. Though as the aforementioned Paraprofessional Health Institute analysis of home aide wages suggests, inconsistent scheduling, lack of earned sick pay and other unfavorable conditions could mean workers earn considerably less. Ten-year employment projections for Nevada won’t be compiled until later this year, according to the Department of Training, Employment and Rehabilitation, which does the compiling. But prior analysis of extant Nevada projections found much the same narrative as that outlined in the recent BLS national data: Led by occupations in the retail and food service industries, the jobs projected to grow the most in Nevada are low-paying, and those low paying jobs already account for about a third of all the jobs in the state. In fact, according to Nevada’s most recent 10-year employment projections, more than 60 percent of all jobs that will be created in the state through 2024 will require only a high school diploma or less. Whether the corporate tax rate is at its former 35 percent, or its now current 21 percent, or zero, Nevada will still need retail salespersons, restaurant and fast food workers, janitors, cashiers and home care aides. The tax bill isn’t going to change that. Tax-cut advocates assert that if employers are more profitable, that will translate to higher wages for employees. Some companies have in fact announced higher wages, and attributed them to lower taxes. Wells Fargo grabbed headlines last month when it announced that thanks to the tax bill, the banking giant would raise its minimum wage to $15 an hour. That announcement was celebrated with much more fanfare than its program to begin boosting minimum wages to as much as $17 – which Wells Fargo announced more than a year ago. Also citing the impact of new tax cuts, Walmart this week announced that it will raise its minimum wage from $10 to $11 an hour. Perhaps no corporation has faced more public pressure about its historically inadequate wages than Walmart. That pressure, combined with the post-crash tightening of the labor market, may explain Walmart’s systematic plan to start raising pay, which the company announced … in 2015. Whatever the reason, Walmart will be spending perhaps an additional $200 million a year on higher wages, and an estimated $400 million on one-time bonuses. That’s good news for the company’s 1.2 million workers, 14,000 of whom are in Nevada. But even better news may be in store for Walmart investors. In October, Walmart announced a new $20 billion stock buyback program. Stock buybacks don’t grow a business or add value to the economy but they do boost shareholder value and shareholder earnings. Walmart has been one of corporate America’s most insatiable “buyback monsters” since the start of the century. In dollar terms, the company’s recent moves to increase employee pay is paltry by comparison. Meantime, raises do not appear to be on the horizon for personal and home health aides. The home care aide industry is somewhat concerned that as tax cuts increase the deficit, Congress will reduce spending on Medicare and Medicaid, which provide 75 percent or more of corporate home care aide revenue. But that concern evidently isn’t pronounced enough to tarnish the industry’s prospects with investors: On the same day Senate Republicans passed the tax bill, Kindred HealthCare Inc., among the largest home care aide providers in the nation with several operations in Nevada, announced that it had been purchased by a partnership between the insurance giant Humana and a pair of equity funds for $4.1 billion. Kindred shareholders were paid a 27 percent cash premium for their stock. And like the private sector health industry overall, the home aide sector is projected by analysts to profit handsomely from tax cuts. Yet there is no comparably bullish outlook for the nation’s 3 million home care aides (of which there will be 4 million by 2026), nine out of ten of whom are women, and a majority of those women of color. In an email exchange, the National Association for Home Care and Hospice, the industry’s Washington lobbying organization, was asked if the group was “aware of any statements or analysis, within or outside the home health community, indicating that home health aide wages and/or benefits will increase as a result of the Tax Cuts and Jobs Act of 2017.” Through a spokesperson, association President William Dombi said he knew of no such analysis. The same question was posed to spokespersons at Kindred and two of the nation’s other large home aide care providers, Amedisys and Almost Family. There was no response. The fact is employer profitability has become increasingly disconnected from wage growth. In the 21st century, corporate profits as a percentage of GDP have reached heights not seen since the 1950s (when the corporate tax rate, by the way, was over 50 percent). But unlike the 1950s, wages have not kept pace with corporate profits. If giving employers more money translated to higher wages, as tax cut enthusiasts contend, real wages adjusted for inflation would have been rising impressively over the last 40 years. Instead, middle income real wages have barely budged, and real wages for low income workers have fallen. Champions of the tax bill preach an inviolate faith that growing markets lead to broader prosperity. Markets have enjoyed unprecedented growth since the 1970s. Yet over that same period markets have failed to improve the prospects of the very employees who, by their labor, made market growth possible. Lower taxes may (or may not) be one of several factors prompting this or that company to pay workers a little more. But lower taxes are not going to upend a profits/wage structure that has left workers behind for decades. Even if they don’t get a raise or a bonus, millions of people who fill society’s crucial but low-paying jobs will at least get a tax cut. For example, according to the tax plan calculator preferred by Republicans, a typical personal care aide in Nevada who is single with no children and earns the BLS-reported median income of $21,920 might pay $214 less in taxes, or $4.12 each week. If she has a child, then, thanks to the tax bill’s doubling of the child tax credit, she might pay $712 less, or $13.69 a week. And yes, every little bit helps. But consider this: If instead of (or in addition to) a tax cut, what if she got, say, a 50-cent raise? Her pre-tax income would increase by $1,040, or $20 a week. And what if the minimum wage was raised to $15 an hour? Her annual pre-tax income would increase by $9,297.60, or $178.80 per week – 43 times more than the $4.12 a week the care aide without children will get from the tax cut. Now imagine the economic impact of distributing that strengthened purchasing power to the millions of other working people who are currently earning what are effectively poverty-level wages. A more fairly and equitably distributed prosperity would do more than increase the value of our most common yet most forgotten jobs while improving the quality of life for the people who fill them. It would also send not ripples but waves through the entire economy, truly lifting all boats – including, yes, the yachts of the rich. A soaring stock market, increased shareholder dividends, publicity stunt bonuses, scattered and modest wage increases, and even the creation of a few “good” jobs should not be mistaken for a thoughtful policy designed to help millions of workers who need help most. The workers who need help most are the workers the tax bill forgot.